Cookies are my downfall. I could eat a bunch in one sitting. I don’t, but I could. 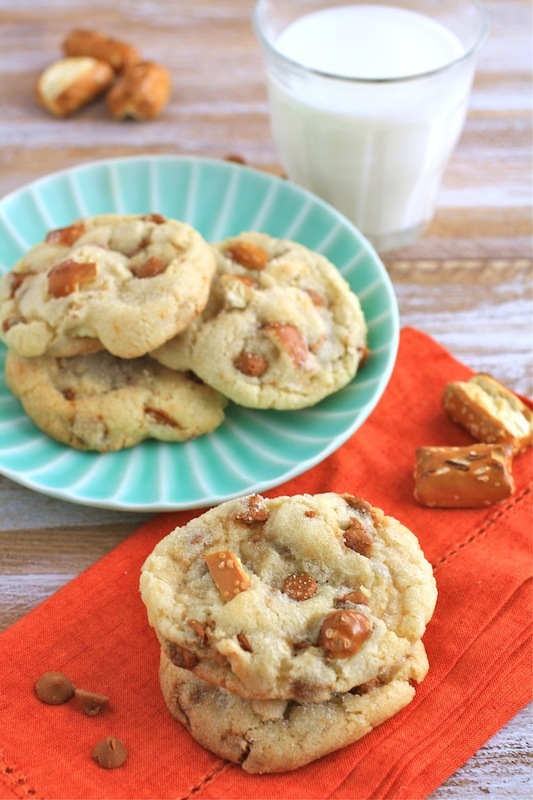 These Cinnamon Pretzel Crunch Sugar Cookies are seriously tempting and seriously delicious. They’re chewy and crunchy, sweet, and cinnamon-spiced. 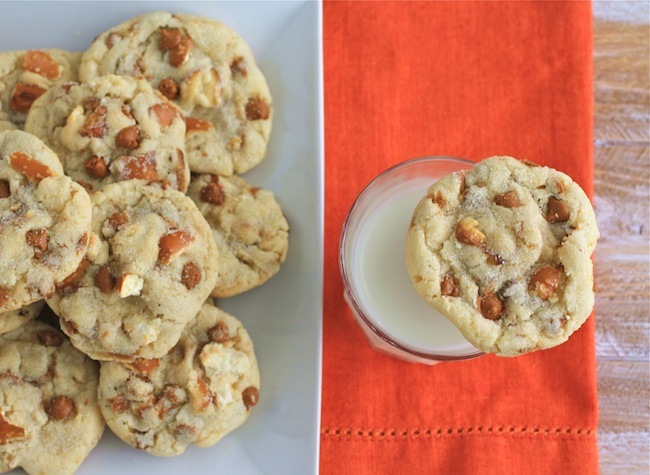 These cookies are reminiscent of Snickerdoodles – my husband’s favorite. Me? I’d pick a chocolate cookie any day of the week (along the lines of these Dark Chocolate Brownie Drop Cookies), but these have won me over. They’ve definitely won over my hubs. He can’t keep his hand off them! I usually try to give away the treats I make to neighbors and friends, but my husband decided to be a little greedy with these cookies. “I think we need to keep these to ourselves,” he said, not really wondering. I came across Hershey’s Cinnamon Chips at the grocery store recently, so instead of making the traditional cinnamon-sugar favorites, I decided to do something a little different. I’d use the chips instead of ground cinnamon, and add a salty, crunchy component to the mix using crushed pretzel nuggets. And there you have Cinnamon Pretzel Crunch Sugar Cookies. After putting the dough together and refrigerating it for an hour, I rolled each ball of cookie dough in sugar. I also added a few chips and pretzel pieces to the surface of the balls to be sure to carry the taste and texture from the inside of the cookies, out. 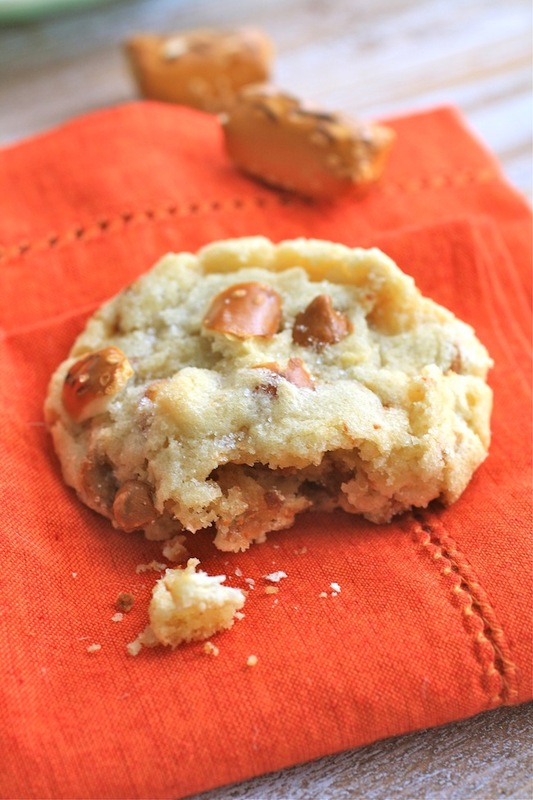 These cookies are a textural treasure and they taste amazing, too. They’re a delight any time of year, but the cinnamon chips melting inside them make them perfect for the fall. 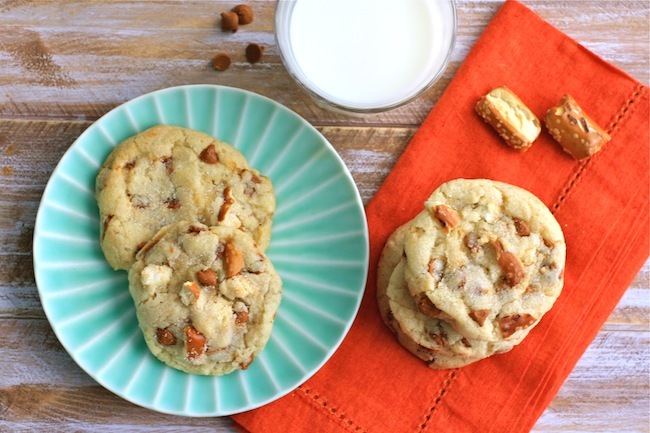 Give these cookies a try, but you might want to make an extra batch to share. Cream the butter with a mixer for about 1 minute. Combine the sugar, baking soda, and cream of tartar in a small bowl, and whisk. Add the dry mixture to the butter, and blend for about 1 minute. Add the egg and vanilla and blend until smooth. Add the flour to the mixture, a little at a time, and stir with a wooden spoon until the flour is incorporated. Fold the cinnamon chips into the dough, followed by the pretzel pieces. Place the dough in the refrigerator for about 1 hour. Roll the dough into balls that are about 2 inches in size. Add the 2 tablespoons of sugar to a shallow bowl. Roll the dough balls in the sugar, add a few extra chips and pretzel pieces to the surface, and place them on the baking sheets about 2 inches apart. Bake the cookies for 8-12 minutes, or until the edges turn golden. Remove the cookies from the oven and let them sit for a few minutes before transferring them to a wire rack to cool. I love these cookies! I've been wanting to try those cinnamon chips too. Glad you used them and liked them! Pretzels in cookies! Love it. Pinned! :) Thanks so much, Lindsay! I could definitely polish off a whole tray of these cinnamon pretzel crunch sugar cookies right now.. they look seriously so delicious. Great recipe & Pinned! I really love this flavor combination! I bet these are majorly addicting! Oh my goodness, I could totally eat all of these in one sitting!! I know, Kelly! Thanks for stopping by! What a great cookie to make for holiday gift giving! I can't wait to try them! I love salty and sweet together and these fit the bill. Great recipe. Me too, Patty! Thanks for stopping by! I love baking with pretzels. Your cookie recipe caught my eye. I pinned and shared on my page! Can't wait to try them! What a fantastic looking cookie, YUM!! They look incredible, Patricia! I want a whole batch for myself! the cinnamon and pretzels together - what an idea. My wife would absolutely love these. I am going to try these for a Thanksgiving-time bake shop event. They are sure to be "gobbled" up. They're yummy! I "gobbled up" most of mine!